This comprehensive collection of full color illustrations and unique artwork provides you with realistic representations of Earth’s processes to supplement your lectures, labs, and activities. 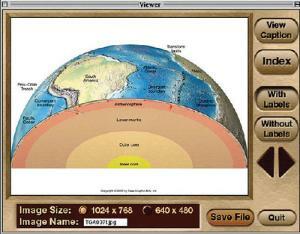 Ideal for PowerPoint® presentations, these images offer students real-life examples of the physical features and earth science phenomena featured in their texts. Each of the 100 images on the CD-ROMs can be displayed with or without captions or labels, allowing you to customize the pictures for various uses, from tests and quizzes to review and topic introductions. Many of these images are featured in Earth, 7th Edition, and each image is available in two sizes — 1024 x 768 or 640 x 480 pixels. Four separate CD-ROM volumes address the different core areas of earth science study. Volume One includes images addressing Matter and Minerals; Igneous Rocks; Volcanic Activity; Weathering and Soil; Sedimentary Rocks; Metamorphic Rocks; Geologic Time; and Mass Wasting. Volume Two includes images depicting Running Water; Groundwater; Glaciers and Glaciation; Deserts and Winds; and Shorelines. Volume Three includes images covering topic areas of Crustal Deformation; Earthquakes; Earth’s Interior; Ocean Floor; Plate Tectonics; Mountain Building; Energy and Mineral Resources. Volume Four includes images illustrating Atmosphere; Pressure and Wind; Moisture; Weather Patterns; Climate; Solar System; Light and the Sun; and Beyond Our Solar System.